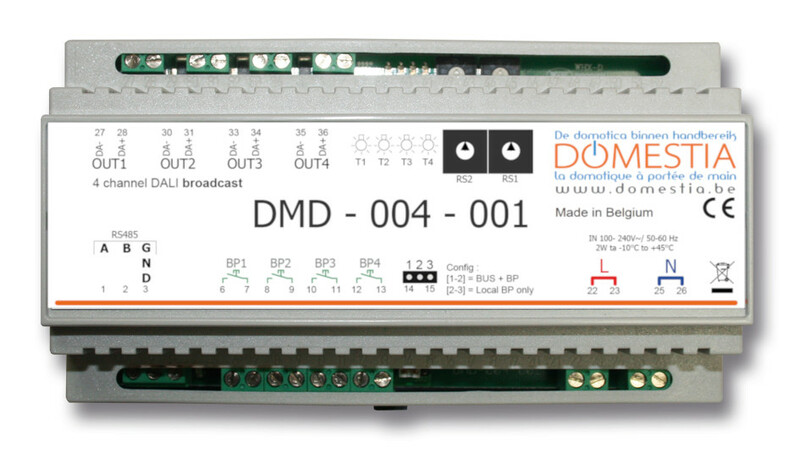 The “DMD-004-001” is a 4-output DALI Broadcast extension module: it is connected to our Starter Kit or to our management unit via communication bus RS485. It can also be autonomous and managed directly via a push-button including all on or all off functions. It can be used to manage 4 DALI lines in broadcast mode (max. 64 lights per line). When a push button (PB) is being pushed, the associated output will be dimmed. A brief press of the PB when the output is "on" will turn the latter off. A brief press on the PB when the output is "off" will turn the output on at the last brightness applied to this output. Number of outlets available: 4 outlets with a maximum of 64 lights per DALI line. Each of the outlets has an internal fuse. Communication bus between the cards: RS485. Does not require a DALI power supply.